It would have surprised no one that Charles Savage became a sailor. He had been born in Brightlingsea in Essex, where the River Colne joins the North Sea. His father was a mariner, as were both of his grandfathers, and many of his uncles and cousins. His brother was a mariner, too, and so were his brothers-in-law, Sidney Siebert and Harry Doyle. 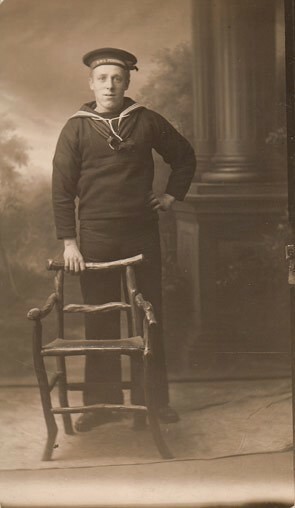 Charles Savage, circa 1920, from the Britain, merchant seaman 1918-1941 collection. There were various types of job for a sailor – you might be a fisherman, you might be a steward on an ocean liner or work in the boiler-room, you might be crew on a rich man's yacht. In fact, Charles' cousin Harry Field (my grandma's uncle) was crew on HMY Britannia, along with many local men. For this reason, Britannia's last racing flag hangs in the sailing club at Wivenhoe, a few miles downriver from Brightlingsea. 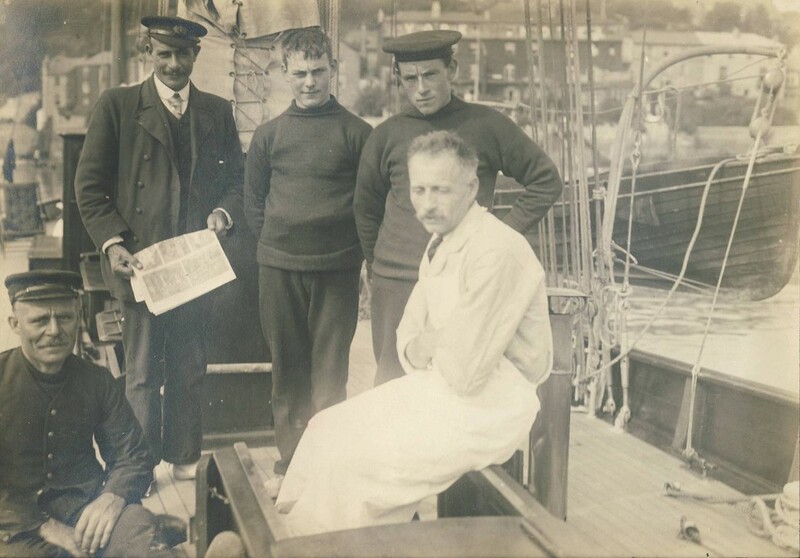 My great-great-grandfather as yacht crew is on the left of this photo. We think his son Harry is standing behind the cook. But the sea is unforgiving. A placid stretch of water one minute, with a good breeze catching the sails, can turn swiftly into a lethal squall with waves like mountains and gales that rip the strongest sailcloth. In 1883, a violent storm tore across the North Sea, and 200 sailors from many different countries were killed. Nineteen of those men came from Brightlingsea. Reverend Pertwee, the local vicar, saw the effect this loss had on his community, and so he established an unusual memorial – each sailor that died just doing his job would be commemorated with a tile along the wall of All Saints' church. There are 213, the last added in 1988; one of the tiles commemorates a local man who died on the Titanic. Charles Savage had two sisters. Lilian was married to Harry Doyle, a mariner who was originally from Kilburn in London. His other sister, Winifred, had married Sidney Siebert in 1907, and moved to Shirley, a suburb of Southampton. Sidney had been born in Battersea, the son of Conrad Siebert; Sidney's grandfather was German. Sidney's mother was from Brightlingsea, and it seems that Conrad abandoned Sidney's mother and married bigamously when Sidney was eleven. By 1901, Sidney and his brother were living in his mother's hometown with her aunts; it was how Winifred and Sidney met, but it was also, perhaps, how Sidney was drawn to a life at sea. In early April 1912, Sidney wrote a letter (sold at auction in 2012) to 'My Own Darling Winnie' from Belfast Public Library, telling her about the Titanic's sea trials. He and Winnie had had two children by this point, but only one, Lilian (perhaps named after Winifred's sister) survived. He'd had an uncomfortable journey to Belfast, and he doesn't seem overwhelmed by the city – he preferred Southampton. He says he doesn't like being away, but it of course came with the job as a mariner. He told his wife that he had to get on and earn some money, and that she was to 'Kiss baby for me tell her her daddy wants to see her and I want to see my other little girl as well' – the other little girl being Winnie, as the Sieberts only had one child at this point. After its sea trials, the Titanic set off on its maiden voyage, leaving Southampton on 10th April 1912. Charles, aged 23, and Sidney, 29, were aboard, and both gave their address as 8 Harold Road in Southampton. They were bedroom stewards, part of the victualling crew, who looked after the passengers on board. Late on the night of 14th April, the Titanic struck an iceberg and nearly three hours later, the unsinkable ship disappeared beneath the cold waves of the Atlantic Ocean. 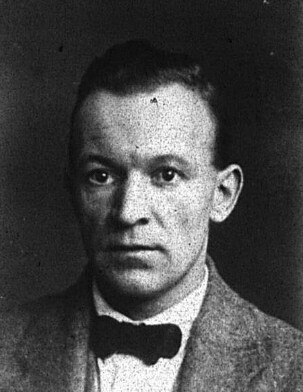 Mr Stephen Savage, of Brightlingsea, has received a message from his son Charles – one of the crew of the Titanic, who was reported lost – stating that he is alive and well, but that his brother-in-law, Mr Siebert, is among the missing. Some sources say that Sidney was pulled from the water, but died in lifeboat 4. However, other sources say he was never identified. Either way, Sidney Siebert did not come home. There is Pathé film footage of some of the crew who survived, mugging for the camera. I've watched it several times, wondering if I can spot Charles, but I find it hard to imagine that someone who knew he had very likely lost his brother-in-law would be playing the fool for a camera crew. 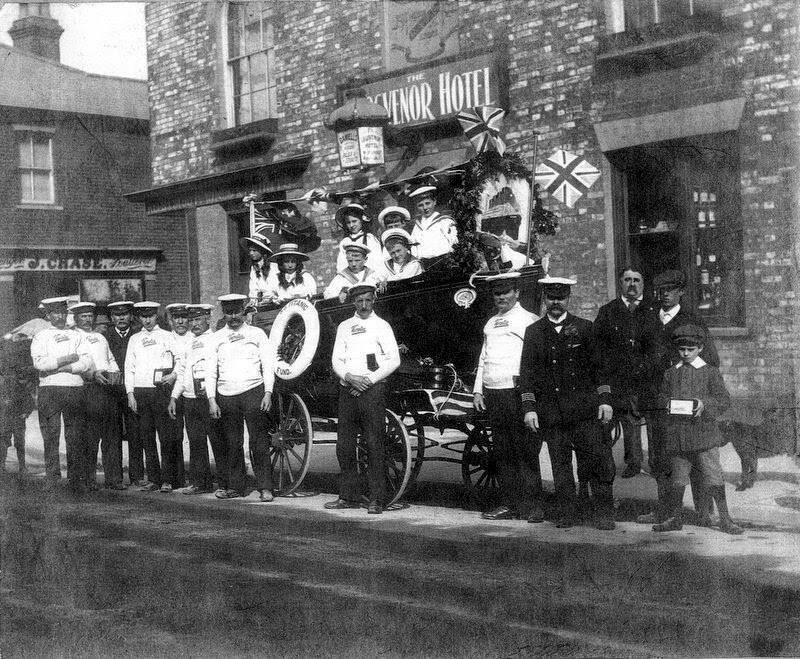 Crew of the steam yacht Venetia collecting funds for Titanic survivors, widows and orphans in Colchester, not far from Brightlingsea. Courtesy of Wivenhoe Memories. It was bittersweet for the family. On 11 December 1912, Winnie took Constance, her newborn daughter, to Brightlingsea All Saints to be baptised. A note in the margin, referring to Constance's parents, reads: "The above Sidney Conrad Siebert perished in the wreck of the SS Titanic." A tile for Sidney was added to the many that already lined the walls inside the church. The loss of the Titanic touched the nation, particularly in coastal towns where people who worked the sea knew only too well the dangers they risked in setting sail. Collections were made for survivors who had lost everything they owned in the sinking, as well as for the widows and orphans of the lost crew. Winifred may very well have benefited from these donations. Harry Field, Charles' cousin, forced to swap yachts for the Royal Navy. Charles Savage might have survived the sinking of the Titanic, but come 1914 he would be facing danger again. At times of war, all men in the merchant service could be co-opted into the Royal Navy, and for this reason, they were all "ticketed". They were entered in a register, and, depending on when the ticketing was done, details such as date and place of birth, level of literacy, height, hair and eye colour were recorded. Some early 20th century records even include a photograph – which is where Charles' photo, above, has come from. These records are available at Findmypast, and are extremely valuable when you consider that the nature of these men's jobs means they might be missed off several censuses. Charles' cousin Harry, who had crewed racing yachts, served in the Royal Navy in WW1, but Charles' medal card shows that he remained in the merchant naval service during the war. Harry Doyle, his surviving brother-in-law, had become a sub-lieutenant in the Royal Navy; he was killed during WW1 and was buried in All Saints churchyard in Brightlingsea. He has a commemorative tile inside the church near Sidney's, which tells us that he was killed on H M Patrol Yacht 'Verona' off Cromarty in 1917. Charles survived WW1, as did his brother Steve Savage – this was his first name, rather than it being a shortened version of Steven or Stephen. Charles was still working in the merchant service when in March 1932 he married Edith Hollis at the Register Office in Brighton. He was a bachelor at 43, and Edith was a widow, aged 49. Charles gave his address as Shirley, Southampton – a handy address, as most passenger ships sailed from Southampton or Liverpool. He was probably living with his widowed sister, Winifred, between voyages. I wouldn't be surprised at all if Charles met Edith through his job, while she made a sea journey. She came from a grand family – her father was Archibald Geikie Brown, a Calvinistic Baptist minister, himself the son of a wealthy banker, a relative of the artist Ford Madox Brown and author Ford Madox Ford. Charles, by contrast, came from a family of Essex sailors. But it's easy to think of a scenario where Edith found herself charmed by the 5' 11" grey-eyed steward attending her cabin (a physical description we can build up from the details in his merchant navy records). Perhaps he wooed her with his tale of surviving the Titanic. 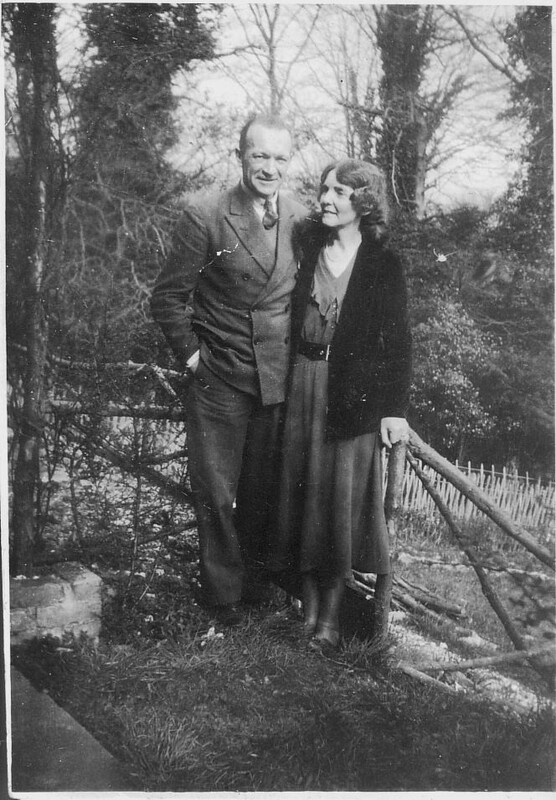 Charles and Edith in the garden of their house in Brighton. Photo by permission of a family member. You can find Charles, the Titanic survivor, on the 1939 Register, living – or perhaps staying – in Brightlingsea with his brother, Steve and his wife Elsie. Steve's occupation is given as 'bedroom steward', along with his merchant navy ticket number – important to record in the Register in case he was co-opted into the Navy. Charles' entry tells us that he's a Pullman car attendant – between 1932 and 1939, therefore, he had given up oceans for railways. But where was Edith? She was in Saffron Walden in Essex, on the other side of the county from her husband, living with her brother and his family. There's an irony in that her brother's profession is given as "Late Genl. Sec. British Railway Stockholder Union" when Edith's husband actually worked on the railways. This led to me to wonder about Charles and Edith's marriage. They clearly came from different backgrounds, and it occurred to me that they might have hidden their relationship. Is that why they were living so far apart on the 1939 Register? But it can't have been that secret, as she uses Charles' surname. Given that her father was a preacher, were Edith's family, posh though they undoubtedly were, not overly fussed that Edith had found love, even if the chap was a Pullman car attendant. And there's also the fact that Charles was not her first husband – in fact, he was her third. But there is something rather odd, which I thought I shouldn't mention, but given the dramatic nature of this story, I've decided is worth relating. Edith divorced her first husband, but when she married Charles, she said that she was a widow – even though her second husband was still alive. In fact, following her second husband through the electoral registers, he is alone throughout the 1930s, until Edith reappears at his address in 1938, using his surname. Had she gone back to him, or had her name been added for some other reason? Is she living with her brother in the 1939 Register because she had left Charles, or was she only staying with her brother temporarily? It's rather mysterious. Even if their relationship went through a rocky patch, after WW2, Charles and Edith were together again - they left Britain and emigrated to Canada. This may be because it's where her children from her first marriage had emigrated to with their father. You have to wonder how Charles felt as they headed over the Atlantic; he must've remembered what had happened thirty years earlier on that freezing Spring night, as the iceberg struck. But despite the odds, he had survived. Who will you discover in the 1939 Register?